Stephen Crowley, Ph.D., is an Assistant Professor of Philosophy at Boise State University. He is a graduate of Indiana University (Bloomington) where he was part of a rich inter-disciplinary community (philosophers, computer scientists, psychologists, and biologists) working on issues in animal cognition and a founding member of the philosophy departments’ Empirical Epistemology Laboratory (A group focused on applying methods from the social sciences to issues within the theory of knowledge in particular as well as philosophy more generally). Since arriving at BSU, Dr. Crowley’s research has focused on the twin issues of providing a coherent intellectual framework for empirical philosophy and the study of epistemic barriers to cross-disciplinary inquiry. He has combined those interests via participation (as co-PI with colleagues at the University of Idaho) in a major NSF funded project (SES - 0823058) which is testing a workshop based method for improving communication in cross-disciplinary research. Paul Hanges, Ph.D., is Professor of Industrial/Organizational Psychology and is currently the Associate Chair/ Director of Graduate Studies for the University of Maryland’s Psychology Department. He is also an affiliate of the University of Maryland’s R. H. Smith School of Business and the Zicklin School of Business (Baruch College). Originally from New York City, Paul received his Ph.D. from the University of Akron in 1987. His research focuses on three themes: a) human resource practices, team/organizational diversity and organizational climate, b) leadership, team-processes, and cross-cultural issues, and c) dynamical systems theory and other research methodology issues. He has published one book and has one book pending. He has written over 70 articles and book chapters. Paul’s publications have appeared in such journals as Advances in Global Leadership, American Psychologist, Applied Psychological Measurement, Applied Psychology: An International Review, Journal of Applied Psychology, Journal of International Business Studies, and Psychological Bulletin. He is on the editorial boards of the Journal of Applied Psychology and The Leadership Quarterly. Paul is a fellow of the American Psychological Association, Association for Psychological Sciences, and the Society for Industrial/Organizational Psychology. Maritza Salazar, Ph.D., is a post doctoral research associate at UCF’s Institute for Simulation and Training. She earned her Ph.D. degree (2009) in Management from the Leonard N. Stern School of Business at New York University. Her research interests lie at the intersection of organizational learning, team processes, and team composition with an emphasis on how collaboration occurs across diverse boundaries. Her specific interests center on the mechanisms that facilitate collaborative processes and outcomes in knowledge-diverse and culturally- diverse teams to enhance creativity and innovation. She utilizes a multi-method approach that combines deductive, quantitative and inductive, grounded theory techniques to investigate under-explored research questions related to the how knowledge and culture diverse teams can effectively work together to find the factors that enable them to achieve shared objectives. Marta Sales-Pardo, Ph.D., is working in understanding how initiatives such as that of the CTSA are achieving their goal of stimulating the creation of new research partnerships with the aim of tackling basic medical problems that are at the interface between disciplines. 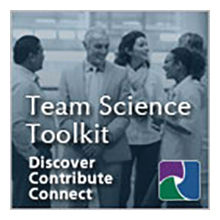 The purpose of this research is to pinpoint the mechanisms responsible for the creation of new successful partnerships through the use of Science of Team Science tools, including social and complex networks analysis and agent-based modeling.